^ Merry E. Wiesner, Gender, Church and State in Early Modern Germany (London: Longman, 1998), pp.36-46,and Kirsi Irmeli Stjerna, Women and the Reformation (Malden: Blackwell, 2009). ^ Merry E. Wiesner, ‘Nuns, Wives and Mothers: Women and the Reformation in Germany,’ in Sherrin Marshalled., Women in Reformation and Counter-Reformation Europe (Indianapolis: Indiana University Press, 1989),pp.8-28. 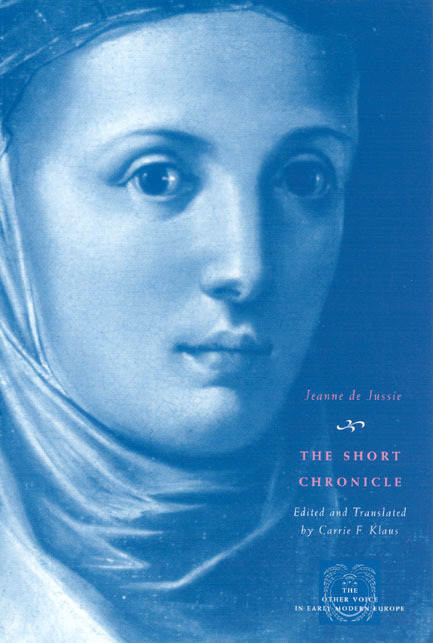 ^ Jeanne de Jussie, The Short Chronicle (Chicago: University of Chicago Press, 2006). 另一相關著作：J. Skocirand M. Wiesner-Hanks eds., Convents Confront the Reformation: Catholic and Protestant Nuns in Germany(Milwaukee: Marquette University Press, 1996). ^ Anne Winston-Allen, Convent Chronicles (Chicago: University of Chicago Press, 2006), pp.1-17. ^ Jeanne de Jussie, p.90. ^ S. Ozment, When Fathers Ruled: Family Life in Reformation Europe (Cambridge: Harvard University Press, 1983), p.49.